We're heading into the last few hours of my Etsy shop sale! Take 10% off any order with coupon code : 10PERCENT. Well. What a busy few months! Since May I've done several mini shows, moved to London, and started grad school. It's been a little while since I've had time for miniatures, but I managed to squeeze some in last week. Pics soon of what I've been working on. Also, Happy Thanksgiving to all those celebrating today! I hope you have a wonderful day with family, friends, pets or whoever you spend your day with. ​My gracious husband has volunteered to take charge of the Etsy shop so that I can open for just a few days this week. 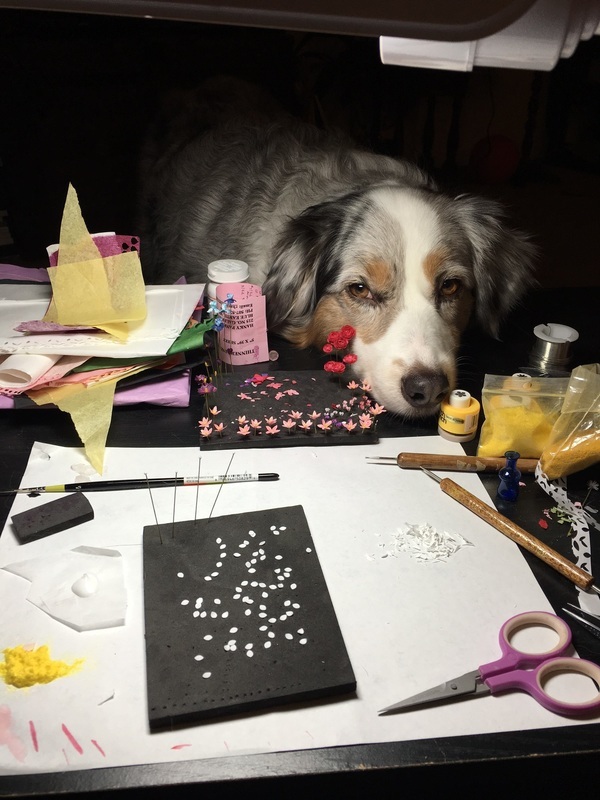 Friday, Saturday, Sunday and Monday my shop: Botiny Miniatures will be open and I'm offering some special deals in honor of black Friday, small business Saturday and cyber Monday. 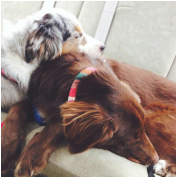 Please do stop by and take a look. The shop will be updated often so if you keep checking back during these 4 days you might see something that wasn't available before. So I had been waiting very patiently since early April to share these photos with you all. I decided this year, a little last minute, to apply for Artisan Member status with IGMA. I spent the last few weeks of March putting together my most complicated flowers that I've made so far. After several very long weeks due to the anticipation of hearing back, I'm excited to post that I am now an IGMA Artisan! I was so happy when I got the news I may have squealed a little ( Which is really saying something, because I am not the squealing sort). Since the jurying is done, I can share my pictures with you all. ..I had to get a little creative with some of the methods I used to make these. The little blossoms on the Solomons Seal were very tricky to get nice and round at the top. And the Jack-in-the-Pulpits were also quite tricky because the spathe (the hooded part covering the plant center) had to be hand cut and rolled so it would be the proper shape. I also had to figure out how to do the coloring on both sides of the paper without it bleeding through or making the paper look extra heavy. It took a few tries, but I got it. ​Thanks for letting me share my good news with you! March is a busy month, and I'm so excited to be heading to Massachusetts for the Handcrafters in Miniatures Show this Sunday. I've been looking at the dealer list and I'm going to be in fabulous company. It's going to be very difficult to stick to my own table and not wander off to look at all the goodies! 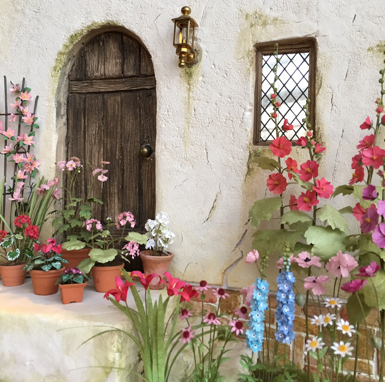 I've been working really hard to make new fantastic plants to bring with me. 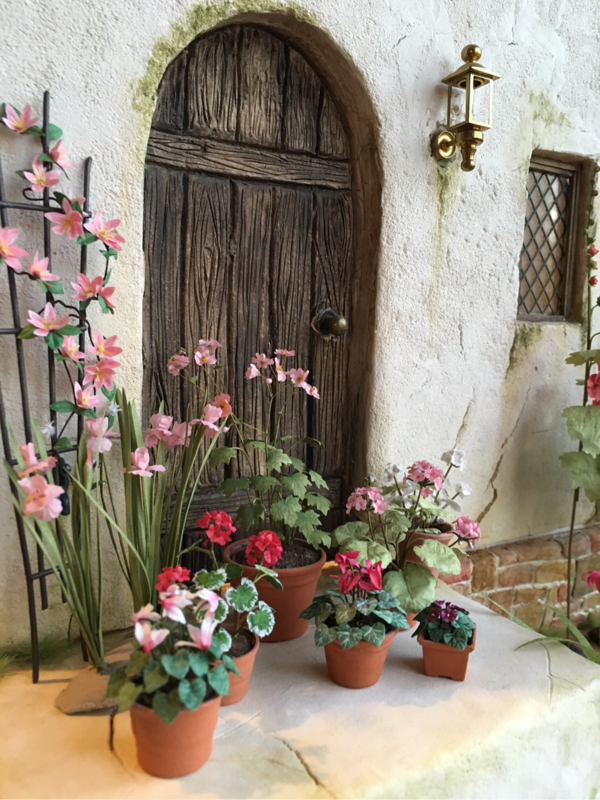 Begonias, cyclamen, roses and, my favorite, Japanese Anemone are just a few. I even tried my hand at half scale. To find more information and a link to the show webpage visit my "shows" page. I hope to see some of you there! 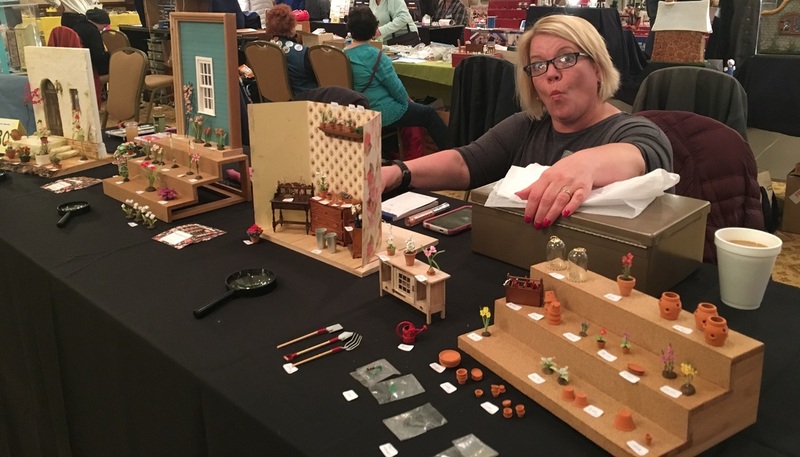 If you're in the area be sure to stop by the Hightstown's Women's Club 37th Annual Dollhouse and Miniatures Show and Sale this Saturday. It starts at 9:30 and ends at 3:30. I will have all kinds of new plants and some great spring flowers! Admission is $5.50. It's been a little while since Maryland has gotten so much snow. We had a blizzard over the weekend (at least according to Maryland's definition), and things are slowly returning back to normal since the storm. But it turns out that when you are stuck at home over a weekend, you can accomplish quite a lot. 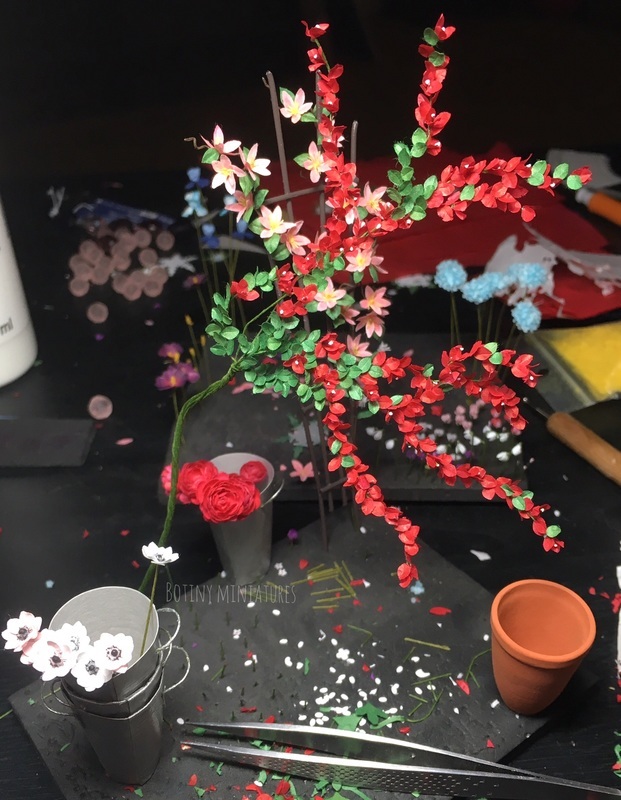 I put my cabin fever fueled energy to good use and got busy making flowers for the upcoming miniature shows I'll be attending. I managed to finish a clematis vine, a bougainvillea vine, hydrangeas, roses, sweet peas and in honor of the snow, snowdrops. I'll post more pictures in the next few days. You can make some of them out in the left picture. While I was able to harness some of my stir crazy energy, poor Molly was not so fortunate, and resorted to staring at me while I worked. I ended up taking a couple of impromptu breaks for snowy walks. How could anyone resist that sweet face? This weekend was a busy weekend for flower making. Since I have several shows coming up in the next few months I've been spending a lot of time creating stock. One of my favorites from this weekend is the Hellebore. Also known as "winter rose" and "Lenten rose", hellebore is often associated with the winter holidays. Hellebores are very cold hardy and are one of the few flowers that bloom during winter and can withstand freezing temperatures and snow. Medicines made from hellebore were used in the past to treat paralysis, gout, worms and a host other ailments. Hellebore is poisonous so please do not use this plant medicinally or for any other purpose except as a garden plant! 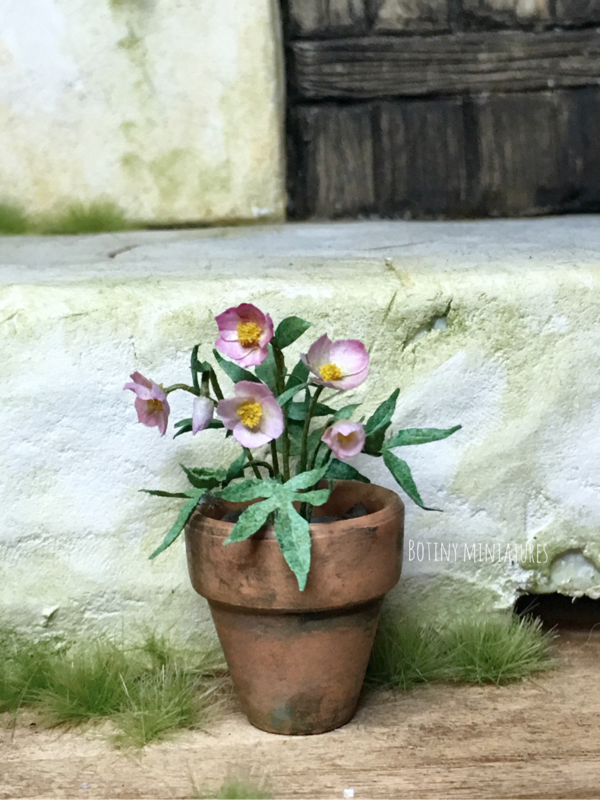 Because of their extensive use as an ornamental plant, hellebores are suitable for a variety of historical miniature settings, from medieval to modern! So, I originally had planned to post this right after New Year, but before I knew it we were halfway through January. I intend to be more active on my blog this year. 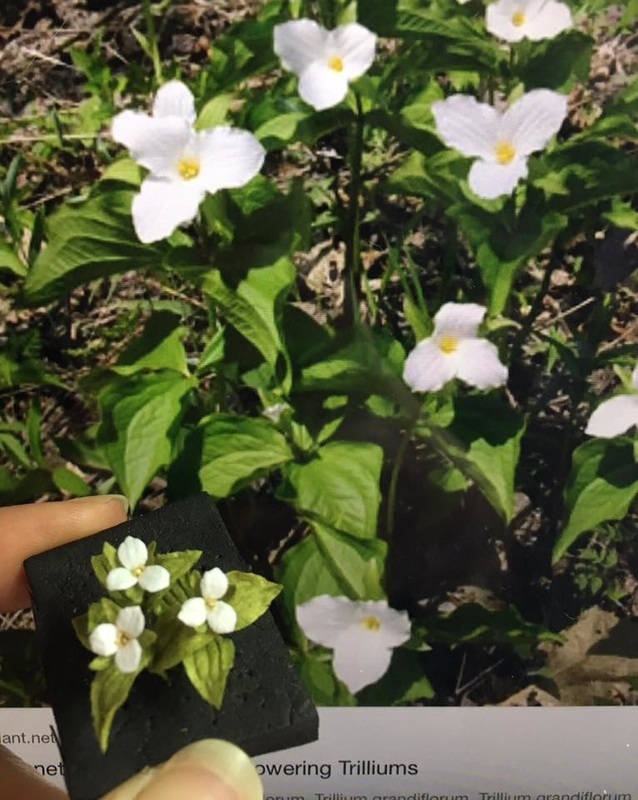 Since I love garden history I thought I would try something a little different and talk a little bit about the history behind some of the flowers I make. The plan is to feature a little background information on a particular flower I've recently completed. The first one will go up next week. Stay tuned! In other news, 2016 is the big year! In September I will be starting my grad program. It's very exciting, but there's a ton to be done, and because of the type of visa I'll be on while I'm there I won't be able to sell my plants at shows or online. Major bummer! In light of that I am attempting to participate in as many shows as possible. You can view an updated schedule of shows under the "Shows" tab at the top of the page. Thanks for visiting, and I hope you come back. 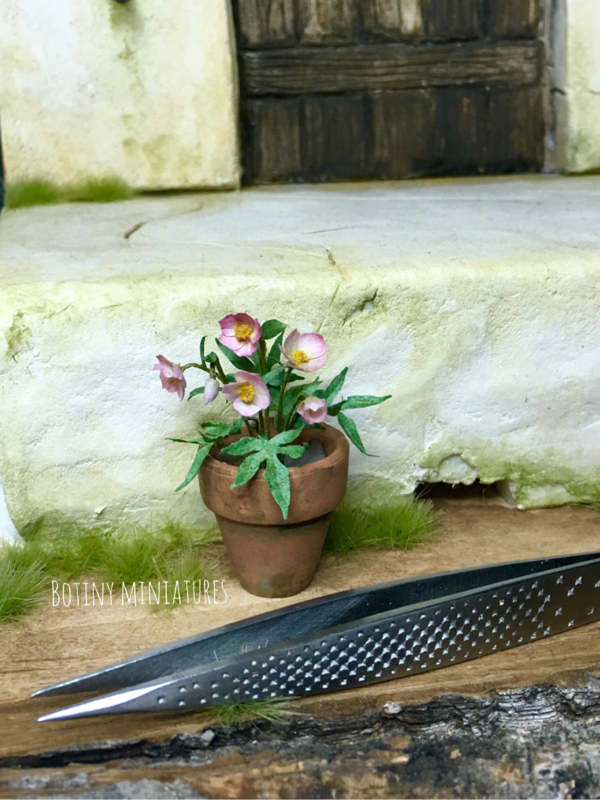 I'd love to hear ideas for mini plants and any that you'd particularly like to be featured in a blog entry. "Financial, emotional, and tiered support for our injured/ill service members and their families through the following programs: Family Support, Adaptive Housing, Adaptive Transportation, Specialized Equipment, Education and Career Transitioning, Rehabilitative Sports programs, and more." In an effort to reach my goal of raising $500.00, I am holding a raffle for the three plants photographed below. These were all made by hand, by me, using paper and floral wire. For every $5.00 you donate to my fundraiser online, your name will be added to my drawing. For example, if you donate $25.00, you're name will be in the hat 5 times, and you will have 5 chances to win. Donations should be made by the 19th, and the drawing will take place 0ct. 20th.